‘Tis the season to be jolly – and yet many people suffer from unimaginably high stress during the holidays. Plans have to be made, presents have to be bought, and the shops and streets are filled with people going through the exact same stress – sometimes wearing their distress too openly. But even when you are a bit behind schedule and some presents are still missing, there is no real reason to feel stressed. Yet, who can really help it, right? 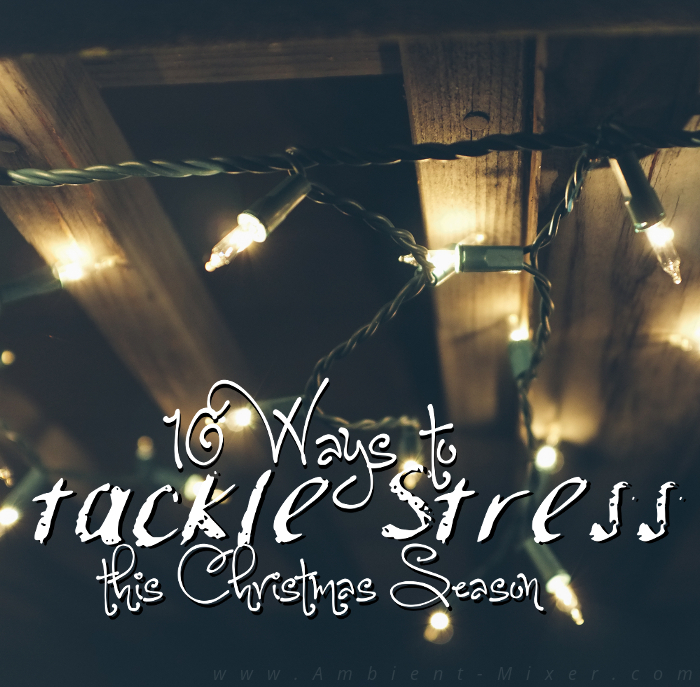 Thus, we have gathered 10 ways to reduce stress around the holiday season. Following these easy tips and advises will make the Christmas stress less harmful, ease your mind, and relax your body so you have all the energy to tackle the holiday tasks again! Head outside for some fresh air and a short walk. The best way to deal with immediate stress is to give it some time, stepping back, and letting a fresh breeze energize you again. Afterwards, you will be able to tackle the task at hand more easily again! Besides, especially in the grey and dull days in winter, getting out into the sun is even more important! Eating the right things can go a long way. There are plenty of stress-relieving and delicious food out there. The best known and sweetest of them all? Chocolate. Especially eating dark chocolate boosts the level or serotonin in your body! But other, more healthy food can help you relief stress as well. Avocados and bananas are rich on potassium which will keep your blood pressure low. Carrots, celery, and other crispy and fresh veggies supply your body with necessary nutrients. To prevent from stress actually making you sick, turn to some nuts and almonds. Already a handful will boost your immune system with zinc and vitamins. And what goes well with all that healthy, happy-making, and stress-relieving food? Tea and milk! Milk is rich on Vitamins B and D, calcium, and protein. Drinking milk relieves tense muscles and adds to a more peaceful sleep when you drink a glass of low-fat or skimmed milk before bedtime. The British know it already: Tea is essential! The hot beverage does not only come in a big variant of blends and calms your wrecked nerves, it also fills your home or office with delicious smells. A Christmas mix of orange, cinnamon, and ginger takes what makes this time of the year so stressful in the first place and creates soothing associations. Though: make sure to avoid caffeinated versions. You want to relieve your stress and not add to it, don’t you? Pro Tip: Mix your own tea blend by combining your favorite flavors. A personalized bag of tea also makes for a great present to equally stressed friends and family members. Pets are non-judging and give you nothing but their unconditional love. Spending time with your pet, may it be napping together, playing, or taking a walk, reliefs stress. There are actually even scientific studies with proof (!) about how spending time with your pet reduces blood pressure. It doesn’t even have to be your cat. Spend some time petting the neighbors grumpy old cat or visit some puppies at your local shelter for a feel good moment. At the University of Maryland, a study had shown that listening to your favorite music functions as an excellent stress reliever when the candle is burning on both ends around Christmas time. Medically, the blood vessels widen to enhance your circulation which lowers blood pressure, slows down the heart rate, and relaxes the muscles when listening to music. Relaxing music is especially designed to serve this purpose. Besides, putting on the fitting musical background will help you to benefit from the next point even more! Pro Tip: Fireplace and rain sounds as well as white noise is said to be especially relaxing. When you have your favorite tune or other musical pieces turned up it’s time to sit back and relax. Taking a nap or simply sitting in a comfortable position and doing absolutely nothing for a few minutes helps you to refocus and get rid of some of the most pressing symptoms of stress. Yet, when your head is full, sometimes it’s sheer impossible to just sit back. In this case, you have to lend your brain a hand and distract it from it’s current unnerving thoughts. Fleeing into a fictional world by reading a book, watching a movie or television series, or by searching for some funny videos online can go a long way in giving your brain something else to think about. Getting up and your body moving is a great way to get away form all the stress as well – that is, if you do the right sports. Endurance workout, for example, can add to the holiday stress. Yet, there are plenty of things besides meditation that you can do! Certain forms of martial arts like Tai Chi, Qi Gong, or Ai Chi get your body moving but leave your mind at peace. Wide gestures, controlled breathing, and the addition of water resistance in Ai Chi help you to get away from the stress and to a much more relaxed and happy state. The most obvious pick however is Yoga. Especially restorative yoga is a good pick since it avoids postures and poses that are straining or require a lot of effort. Pro Tip: Pressing down on the flesh between your thumb an index finger for 30 seconds can release stress as well! It’s the so-called hoku spot, and it’s known from Chinese medicine to relieve tension in your upper body. Now, with the initial stress relieved, it’s time to work on not adding new stress. As boring and plain as it may sound, organizing yourself is the first step to not have any new stress added on top of the one you already have. Organizing starts with creating a clean environment. Sort out papers, remove packaging and other useless stuff from your desk, change the sheets on your bed… Cleaning up your workspace, apartment, or room means cleaning up your mind as well. There is nothing to be said against a little coordinated chaos, but it’s way easier to relax on a couch that is not scattered with clothes, paperwork, and other things. Afterwards: make a plan or a to-do list. Organize your future, so to speak. If you write down what has to be done until a specific date – in this case Christmas Eve – you will see that it’s actually not that much. Thoughts running wild can be banned on paper, structured, and help you to create a step-by-step plan that is easy and stressfree to follow. Once you have everything sorted out after the relaxation you deserved so well, once all plans are made, get rid of a very crucial trigger for stress: turn off your phone! The feeling and need to be reachable 24/7, seven days a week, is what adds stress the most. Just when you are in the middle of doing something, ticking off the points of your list for example, you receive an “urgent” call, email, or message. And the stress is back. No, you do NOT have to be available for everyone every minute of the day. Turn off your phone and push it away, out of your thoughts! Once you are feeling more relaxed again, or once you advanced quickly on your plan or list, you can switch it on again to check your messages – but don’t stress too much over it! The final step to relieve all this Christmas stress is to become aware of that fact that this is YOUR Christmas! You decide where to go, what to do, what to cook and eat, and who to meet with. Everything you do should leave you with the feeling that you wanted to do this, that you want to be there. Treat yourself! It’s the holiday season after all and YOU have earned the right to relax and simply have fun as well!